Cannabis has been making major waves in the beauty and wellness industries. Skin care aficionados have been touting CBD for its various benefits—namely, its abilities to combat inflammation. Brands like Kerklaan Therapeutics are at the forefront of this mission, and they’re helping educate people about the wonderful world of CBD. Dr. Andrew Kerklaan, the founder of Kerklaan Therapeutics, is a renowned chiropractor who decided to venture into cannabis when he treated an elderly couple that was experimenting with cannabis as a replacement for their prescription meds. Inspired, Kerklaan studied cannabis and became convinced of its health potential, but realized there were no real products he could recommend. So, in 2017, Dr. Kerklaan Therapeutics was born. The product line includes CBD:THC topical creams and sprays that focus on pain, menstrual cramps, inflammation, dermatitis, headaches, tension, sleep issues, and more. Get to know more about Dr. Kerklaan and his growing company, below. My personal relationship stems from many patients in clinic benefitting from cannabis as a painkiller, and anti-inflammatory with muscle relaxant effects. It’s amazing to see a natural plant have so many benefits. Who can benefit the most from cannabis skincare? The list of conditions that cannabis can help with is so extensive, it’s quite amazing. We hear about the great results people are getting from our products with the pain-killing and anti-inflammatory effect of cannabinoids. Cannabis is effective for the most common human ailments and conditions. Research has shown that cannabis has the potential to help in conditions like back pain, arthritic complaints, sleep issues, spastic disorders, and immune challenges like psoriasis and eczema. For someone just getting into cannabis as a skin care regimen, what products should they start with? First of all, cannabis topicals are a fantastic introductory product for people who are new to cannabis. 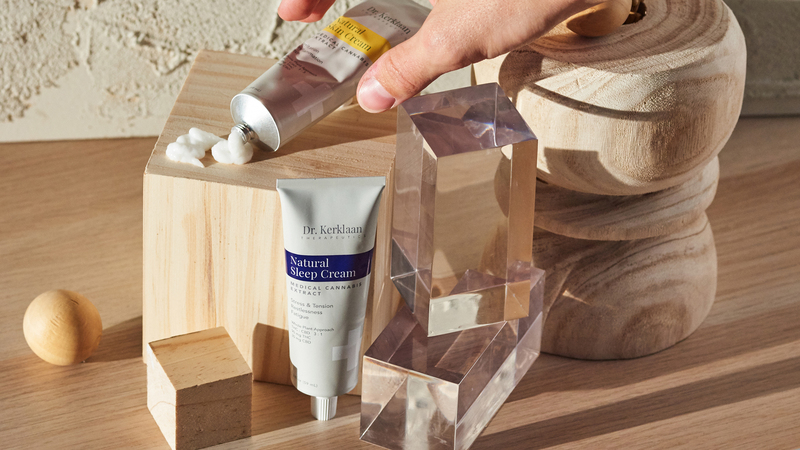 Our Natural Skin Cream offers excellent hydration and the anti-inflammatory potential important in relieving skin issues and maintaining healthy skin and complexion. It can be used as a daily moisturizer and after-sun product, and it’s an excellent repair product for sensitive, irritated skin issues. How do you feel about cannabis as a trendy ingredient in beauty right now? I love this question. Cannabis has been used for thousands of years for skin issues. There’s finally an opportunity to show its true potential with research, mainstream acceptance, and dropping the stigma. As an ingredient in skin care, it offers excellent potential and effects that will carry it well beyond a trendy ingredient. What’s next for Dr. Kerklaan Therapeutics skin care? Our brand and products have received such rave reviews that we are often asked to develop additional products under our skin care category. In 2019, we will be launching new products that complement our current collection.